If you already operate a small business or want to start one, this book will show you what is involved with direct marketing. You will learn about the process of disintermediation to cut out the middleman and increase your profit margins. You will also find reviews of different methods of direct marketing. You will learn about what is involved with direct mail marketing, telemarketing and fax broadcasting. You will also find out how newspapers, magazine, radio and TV can help your direct marketing efforts. Then, take a critical look at advertising in the yellow pages and whether it is worthwhile. You will find out how to create your own Web site and how to conduct e-commerce online. You will learn about techniques to drive visitors to your Web site and about the importance of Search Engine Optimization. Take a look at the issues involved with permission-based e-mail and e-newsletters and the importance of push technology for advertising and marketing on the Internet. You will be given a tour of how to sell at auctions on eBay and how to set up your own eBay store. Helpful hints are provided on how to become a successful seller on eBay. Examine how exhibiting in trade shows and flea markets can help. Take a look at door-to-door selling, making cold calls and selling at house parties. You will learn about some of the topics you will need to address when preparing your own marketing plan and some software programs which can help you create the plan. Then learn about tracking the origin of your sales. Finally, take a look at some of the laws and regulations which will govern your advertising and marketing efforts together with the do-not-call lists and how they may affect you. 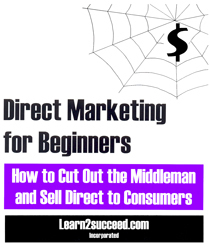 Direct Marketing for Beginners: How to Cut Out the Middleman and Sell Direct to Consumers by: Learn2succeed.com Incorporated: softcover; 160 pages; ISBN: 978-1-55270-352-6; published in 2009; $24.95.